Those who read this blog regularly know that my family background is modest, at best. Instead of that trust fund image many have for world travelers, I attended college on merit-based scholarships. When I decided that I wanted to live a life of travel, instead of counting on help from family, I budgeted for the trip. Of course, it’s never quite that easy. Before I booked my round the world ticket, I faced many obstacles—personal, family, and financial—preventing me from traveling. And for many years, I allowed those issues to keep me tied to the United States. There were a dozen reasons to believe that I could not change my situation: I had to help my family, I was struggling to stay afloat from my debt, I had a relationship and close friends who I would miss. One day, I took stock of my situation. I honestly looked at how my personal choices affected my ability to travel around the world. I realized that I could travel, but only if I drastically changed my situation as well as the personal story I told about myself. To travel, I would need to reprioritize every aspect of my life. I would also have to believe that someone like me could find a way to travel. The decision to travel was the culmination of many re-prioritizations in various aspects of my life. Travel is expensive. It’s doable—it’s comparable to a year of living in the U.S.—but saving that much money is a considerable feat for many. When I left, my income was a smidgen above poverty level. My online job allowed me to work every single week of these past ten years that I have traveled the world. Without online work, I would have spent years saving the funds. But I could have saved. Saving was within the realm of possible. Even more, the U.S. dollar is a strong currency, and I live in a country with work opportunities and a social safety net. If you’re reading this page, there’s a chance you also have one or more of these safety nets and benefits. Money buys happiness up to a point, according to leading research. Once you’re comfortable and you can afford your next meal, happiness stems more from your approach to life. It comes down to your attitude about what you have, and the choices you make. Even before you are cash flush, you can cultivate an approach to life in line with your goals. Happiness is in the content of moment-to-moment experiences. Nothing material is intrinsically valuable, except in whatever promise of happiness it carries. What you own, what you buy, and what you prioritize contributes to the experiences you create in your own life. For anyone who has found this website, you hope to prioritize travel. To choose travel may mean making large shifts in your lifestyle, it might mean second jobs, smaller houses, years of tackling debt. But it’s the larger goal that should motivate you throughout it all, to travel. Challenge that idea at every step of the way. It’s your biggest obstacle toward taking that dream trip. Most things we take as a given—big houses, cars, new smartphones—are a series of choices that align with our priorities. The advice on this page will show you how to align your money priorities with your goal to travel. Spending money well comes down to affording those things you have prioritized—so what are you prioritizing in your life? Do you have secret fears or doubts that have held you back from saving for this big trip? How long have you had this desire to travel? Now be honest: Are you making choices that prioritize your travel goal above lesser ones? I’ve heard a litany of reasons from travel dreamers justifying to me why they aren’t actively saving for their trip. It comes down to things like: car payments, debt repayments, medical debt, mortgage, and a host of other—often valid—reasons. 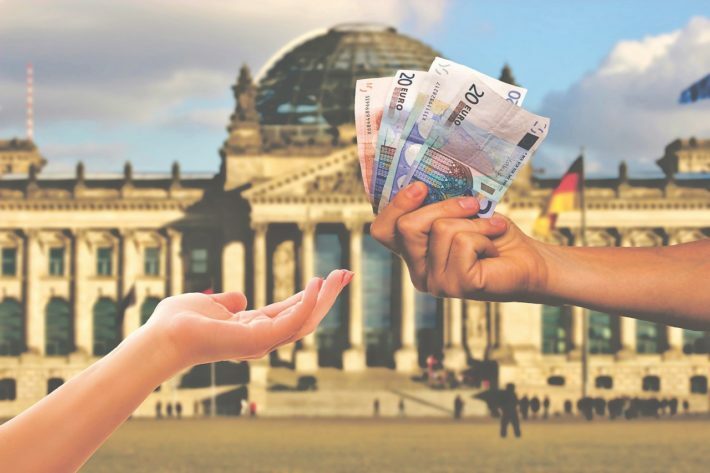 But even beyond the personal issues, the process and action of saving has additional obstacles, and it’s not something that most travelers talk about, mostly because it lies outside of “travel” specifically. 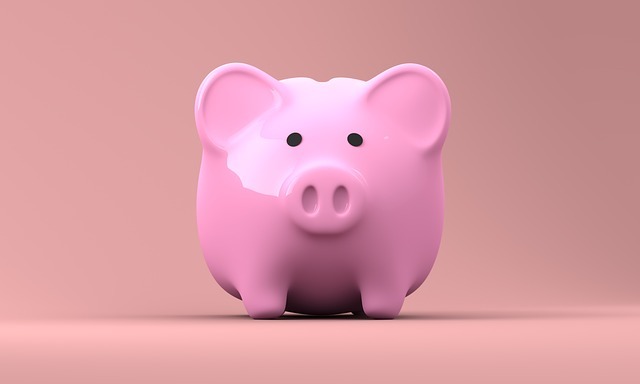 When you’re looking for ways to move the needle on your own savings goals, it behooves you to understand the psychology of saving and money. Money obstacles are just as important as the personal obstacles travelers face when saving for a long-term trip. Let’s dive into areas where you might find resistance as you embark on your savings journey. It’s human nature to start something filled with fiery licks of excitement, only to feel that initial burst of motivation peter out as time passes. This is not the way to accomplish any savings goal, especially one like long-term travel. To successfully save over a long period of time, you must create a pace that fits your situation, goals, and timeline. Think about this as you set your savings plans in motion. Pick a reasonable savings goal each month and year until you reach your target. Then—and this is the hard part—stick to it with small and consistent contributions. Discipline makes a huge difference in saving and budgeting. You will likely face setbacks along the way, but if you start now, the travel fund will increase over the coming weeks and months. Minimalism is a snazzy, trendy topic. It also has a place in any conversation about saving in general, but especially in saving for travel. When you set out on the road, you will have very little left to your name. Even if you have items in storage, before you leave to travel you will have whittled your life down to the essentials, the practical, the nostalgic. Part of owning fewer things is also about buying fewer things. Saving and budgeting for a long-term trip should alter your purchasing habits. It’s small things like understanding that yes, you might need a car to get to work. But saving for travel means recognizing that an older model car might better fit your budget and your desire to sock away all extra money into your travel fund. Saving for travel is the ultimate opportunity to trade material possessions for experiences that forever become a part of your personal story. The reward may be months or years down the line, but keep in mind the end-goal of spending money on the travel experiences that you’ve decided to seek. You will face mainstream media messages pushing consumption, pushing you toward the novelty of owning new things. There is a balance somewhere between bare minimalism and wanton consumption, and by looking at your budget and savings goal we can find areas to adjust. Life is messy. It can careen out of control in a moment’s notice. Sometimes, you may need to pause even the most reasonable and practical savings goals. A myriad of things crop up. Perhaps you’ve lost your job, a recession hit, or you’re helping your elderly parents. There are heaps of reasons we jump off our savings plan. And it’s disheartening, especially when it’s not only a pause in the plan, but a harsh setback that leads to more debt. This savings obstacle may seem obvious to some, but for those with a long road ahead—one that includes reducing debt, learning to budget, and saving—it’s important to start this journey with realistic expectations and the ability to weather outside events. The Optimism Bias is cognitive bias that fuels the belief that negative events are less likely to happen to ourselves than to others. It’s our ingrained, neurological tendency to underestimate the likelihood we will personally experience adverse events. As a result, we are prone to disregard precautions that might limit or mitigate those risks. In her Ted Talk, The Optimism Bias, Tali Sharot discusses how this bias is a powerful force in the human mind. Bias can play a major role in the reason people underestimate the saving and budgeting process. Life has struck me a few times, and it took years to wade out of those messes. I first traveled abroad when I was 21 years old. My brother passed away four days into my trip. I was heartbroken. It took me years to recover from that emotionally. Unfortunately, it took me years to recover from the situation financially, too. I hadn’t planned on purchasing an extra transatlantic flight, but I swiped my credit card and flew home. It took me six years to pay down the initial costs, interest, and related expenses. My brother’s passing was a huge life setback. To overcome it, I had to pause, take stock, readjust the plan, and then continue. I share this painful piece of my history so that you don’t get lost when life throws you obstacles. Keep perspective on the end goal even in the moments of overwhelm. Expect these moments to happen. Take a break, but don’t let that stop you from resuming your savings and budgeting plans as soon as you can. Over the years, I’ve spoken with readers at every stage of their life and with a range of unique personal situations. Many talk with me about what they see as the ultimate financial obstacle to travel: debt. It’s a biggie. Whether it’s student loan debt, medical debt, or credit card debt, as you go deeper into the red, you may find it harder to plan for a long-term trip. Debt is an obstacle, but it’s not impossible to overcome. My Tackling Debt resource page shares strategy and tips, but for now, let’s talk about the psychology of debt. It’s a doozy. Being in debt takes an emotional and even physical toll. If you are facing profound, serious debt, then you likely need to seek the advice of a certified debt counselor, or discuss it with a therapist. There are neurological components, depression, anxiety, and other factors that affect our relationship to debt, and for help with those you should seek counseling. But if you’re facing manageable debt, even if it’s overwhelming, then the techniques on budgeting and debt reduction will help lower your debt load while increasing your travel fund. If you are running right up against your budget every month, then you might consider if there is a way to add to your monthly income. While most people can benefit from the saving ideas in the next section — even when implemented in moderation — making more money is a profound way to increase your travel savings. While some might consider negotiating a raise, others could look to what is called a “side hustle.” This is a growing niche and there are vast resources online about how to build a new stream of income alongside your current work. Read more about side hustles on my detailed advice page on How to Work Remotely & Digital Nomad Resources, or head straight Side Hustle School, a fantastic podcast and resource site with tons of ideas to get you started. For many people, my savings advice is not even plausible at this stage. To begin saving for travel implies a level of comfortability in your situation that may be out of reach at the moment. I have been profoundly poor at stages of my life, where the suggestion of taking on extra work was laughable and my expenses and debt were higher than I could see my way through. If this is your situation, your timeline to travel may be very different from another’s timeline. And that’s OK. If you’re struggling, if even the idea of adding on more work is impossible now, then adjust your time-frame. Even an extra $5 or $10 per week against your debt is progress. And even that much money into your travel kitty is also progress toward your goal. It might take ten years to save, or it might take five years to build up even a modicum of online income, but there is truly an opportunity for most people to save for travel with priorities and a reasonable timeline. I do believe that many people—but certainly not all—can prioritize travel. It’s only at the point that you agree to look for possibilities that you see the opportunities to make it happen in your life. And this isn’t Pollyanna of me to say. Although I was childless when I left to travel, and thus had fewer hard-and-fast obligations and larger life priorities, I worked for years to pay down my debt. And while I wish I could claim it was student loan debt, much of it was credit card debt. Debt happens, especially if you are poor. Some of my debt came from breaking my arm just after leaving college, and thus just after leaving my student health insurance plan. Other debt came from bailing out a complex family situation, twice. The fact is, it was debt and it was hard for me to conceive of a way that I could pull myself out from under it. Even in the first years of travel, my income was barely above the poverty line. I traveled and continued to spend a generous chunk of my freelance income paying down my past debt. For years I had decided that it was impossible to travel and I chose to remain stagnant on my goal. Until one day, when I simply switched my belief. I decided that somehow there was a way out and I simply needed to get creative on how I thought about my situation. You don’t have to know how, only that it is possible. This might not be the ideal time for you to save for a long-term trip. I get that, I truly do understand. But, this is the right time to think about your relationship with money, debt, online work opportunities, and which small steps will make progress on your current situation. The first step is often the choice to make a sincere change, then come actions and follow through. Strangely, choice is often harder than the follow through. By this point, you have a clear idea of your personal financial situation. If you have debt, I hope you use the recommended tactics and resources to tackle the most important aspects of that debt. If you are not creating a personal budget, then you need to research online and create a personal budget. You need a firm handle on your what a realistic savings timeline and goal looks like in your unique situation. Now, let’s look at practical ways to increase the amount of money you put into your travel fund each month. I’m a huge proponent of striking the right balance. It’s why I recommend using a clear personal budget before you decide to save for travel. Get your ducks in a row, understand your debt, plan your retirement goals, and then add your travel goals into that mix. There are three primary schools of thought on approaching a budget (well, three that I think work best, there are many others, too). 1. Consume everything you enjoy, but in moderation. Take a moderate approach to all things and enjoy small splurges—don’t eliminate habits you love, just adjust your expectation of frequency. Budgeting requires forming and sticking to long-term habits. In that regard, the theory goes that by not denying yourself treats and getting burned out, frustrated, or defeated, you are instead better able to develop a habit that sticks and a habit that preserves your quality of life. This is how I budget, even after years of travel. Moderate consumption and moderate spending is how I stay on the road. 2. Ruthlessly cut unimportant expenses, then spend openly and without guilt on those areas you’ve pegged as most important. Ramit Sethi puts it like this “Spend extravagantly on the things you love, and cut costs mercilessly on the things you don’t.” If you have a decent amount of income, this can work well, but if you’re counting pennies then there might not be a lot of room for either cutting ruthlessly, or spending extravagantly. But the psychology of it is high reward, and that goes a long way toward helping stay motivated to budget and save. Sethi’s theory is ruthless though; you pick one or two focuses and the slash the rest nearly completely from your budget. 3. Calculate the opportunity cost of every expense, both discretionary and non-discretionary. Opportunity cost is an economics concept that identifies “the loss of potential gain from other alternatives when one alternative is chosen.” In budgeting for travel, you’ll see this employed by many travel bloggers when they write of their own savings approach and say things like, “Splurging on one new outfit costs the same as traveling for four days in Southeast Asia.” Or, “One night of partying is the same price as a day tour to a volcano in Nicaragua.” The case for retirement savings is also often offered in terms of opportunity cost, but in the opposite perspective. Save your dollars now because compound interest will work in your favor if you invest over the long-term. Spending thousands of dollars to travel now also has an opportunity cost as that money might have grown much larger sitting in a retirement account for 30 years. But, that’s where life and values come into play—it may be more money in the long run, but you’ll miss the opportunity to travel now, when you likely have youth, enthusiasm, and health on your side. All three approaches can work. In each, success hinges on also automating your savings and sticking to a long-term money plan. How you most effectively save and budget can wholly depend on your personality—we’re born with traits that affect how we deal with high-reward or low-reward situations. Sethi and I are two very different people. The methodical, moderate approach melds well with my lifestyle and personality. From his online persona, I can see why and how his approach of high reward works for him. Assess what works best for you, not anyone else. Pick the savings ideology that fits best with how you approach personal finance, and then consider where you can tweak and adjust your own budget, lifestyle, and savings. I’m just going to offer a running tally for this section. A massive list of ideas. Even if you swap out a single spending habit for a saving habit once a month, that gradual change adds up over weeks and months. Some of these are cliché, others are hard to implement, but all of them make small, incremental changes in your spending and savings habits with the end goal of traveling the world. Opt for low-cost, budget outings. Visit museums. Organize an afternoon at the park. Host potlucks with friends. If you’re opting for the second budgeting approach, where you ruthlessly cut out less important areas of spending, you can alter which outings should stay. This might mean keeping the weekly trip to the movies that you truly love, but cutting the after work beers that are less enjoyment and more habit. Make coffee at home. I enjoy coffee shops, and I still purchase from them every week. But now I think of an artisan coffee as my weekly treat instead of a daily necessity. I went for a moderate approach because it’s something that I enjoy, but it’s not a hardship to swap out a couple of my previous coffee trips. When I was aggressively saving toward my goals and paying down debt, I had my bank automatically transfer the $45 per month that I saved from visiting the coffee shop once a week instead of three times per week. Lower your cell-phone plan. Unless you use your cell phone for work, you might have a lot of wiggle room in how much you spend each month. Many major providers offer bare bones plans with just a bit of data, but unlimited calls and texting. While it’s fun to watch YouTube from the doctor’s office, perhaps it’s a habit you can replace? WiFi is rampant and if you lower your plan you can likely shift your habits slightly and ensure you are on WiFi when doing data-heavy tasks. Change your grocery shopping habits. If you shop at Whole Foods, then you might be able to limit that shopping trip to essentials and balance your grocery visits with a more affordable alternative like the “green” version from your local grocery store. Also, consider buying the generic store-brand on purchases that don’t have a strong impact on your life (most non-perishables fall into this, including laundry detergent, shampoo, cereal, etc). Lengthen the lifespan of purchases. While many assume that it’s easy to cut your clothes/shoes shopping budget entirely, that will depend on your current habits. Instead, look for ways to extend the lifespan of your current purchases. If you’re a designer handbag fan, consider skipping an upgrade cycle. If you begin the purging process, you may find clothes and shoes you’ve long forgotten that you can cycle into your wardrobe to “freshen” it rather than buying more items. If you truly love the lure of shopping, consider allowing yourself the chance shop for your travel gear slowly. Build out your travel packing list a little at a time; use your shopping budget to purchase one piece of travel gear each month until you leave. This allows you to quell the shopping urge by purchasing items that actively work toward your goal, and it also lessens the sticker shock of buying those items just before your trip. Or, if you take the Ramit Sethi approach, keep the shopping habit but downsize your apartment. Create a tradeoff for the thing that you most value. Add any irregular or unexpected income to your travel fund. Deposit your income tax return into your travel kitty. If you get a bonus at work, perhaps treat yourself with half of it and save the other half. Balance your spending and saving. Lessen your rent burden. Some people can get away with moving home as a way to lessen expenses. I was in my mid-20s when I planned my trip and I spent my final two months at my dad’s house prepping and planning. If that’s either unfeasible or a totally insane prospect, consider other options like taking on a roommate or downsizing to a smaller house/apartment. Then there is always the option to become an Airbnb host if you live in a desirable part of your city. Assess your memberships. If you have a gym membership, and if you use it, then it might be a non-negotiable to keep this in your budget. For others though, is this a good use of your money? Consider alternatives like your local YMCA or county recreation center. You could also price out day-passes for things like the pool, gym, yoga classes, etc. If you visit infrequently, this may work out to a savings. Cancel cable. Streamline your subscriptions. Don’t give up all your entertainment, but see if there’s anything you’re paying for that you can happily replace with another habit. Perhaps you don’t need HBOGo when Game of Thrones is out of season. Or Netflix is less useful when Amazon Prime let’s you rush ship packages and stream shows. Whatever you cut, remember to add that to your monthly savings figure and automate the transfer of those saved funds. Use your local library. This is seriously a good tip for anyone who doesn’t use the public library—it will become your best friend as you save and plan. In the beginning, use the library as an alternative to buying books. (And if you have a monthly book allowance, remember to set up an automated transfer to add that money into your travel account each month). Most U.S. libraries even offer digital lending programs that allow you to borrow books on your Kindle or e-reader (I borrow Kindle books from my library when I am traveling all over the world to keep myself stocked in reading material for free). As you move into actually planning your trip, you can check out travel guidebooks from the library instead of purchasing one for each planned destination. Lower transportation expenses. If you don’t own your car, is there value in trading it for a model that you can own outright? Can you sell your car (either now or just before your trip) and add that to your savings? Consider public transport, carpooling, and alternative situations to navigate transportation. Several married friends were able to sell one car during their pre-travel savings period. This not only gave them the initial boost from the sale of the car, but lowered car maintenance and insurance expenses too. They set up an automatic transfer to put that money into their travel savings account each month. Reduce banking fees. If your bank charges any monthly or transactional fees then you need to seriously reconsider that bank. Ideally, you should never pay withdrawal fees, nor should you pay a monthly fee for your checking account. There are a lot of options, but I recommend Charles Schwab for most travelers as it is the only bank that will actually reimburse your ATM fees when you’re traveling (I have no sponsored relationship with Schwab, I just truly believe it is the best back for travelers, hands-down). Even if you don’t go with Schwab, look into local credit unions and options that have interest-bearing savings accounts and no added fees and expenses. Open a separate savings account. Keep your new travel fund separate from all of your other accounts: day-to-day expenses, emergency fund, Christmas money, etc. Designate a travel account and directly deposit into this account any new money that generate. Purge. Jumpstart your savings process by purging the many things you have accumulated over the years. Dig out anything stored in corners and under beds. A lifetime of living accumulates stuff. Then, hold a garage sale, use Craigslist, or sell items on eBay. Not only will you need to purge items before long-term travel, purging gives you a jolt of cash and action, which helps maintain the motivation to continue saving no matter your savings timeline (be it months or years). The How to Purge and Declutter page offers extensive and detailed strategies and advice. Cut your spending. Halving your superfluous spending by 50%. Anyone suggesting a more drastic cut has clearly never committed to a long-term goal. Assess your current spending habits, and then look for compromises that do not overly impact your lifestyle. If you begin cutting everything you enjoy, you will eventually stop saving altogether. Instead look for moderation. Trade the mentality of “okay, I should never eat out again” with “I should eat out half as much each month.” Decrease non-essential expenses and then make a weekly transfer of your savings into your dedicated travel savings account. Assess your debt. Debt is a burden and a clear obstacle to travel. Worse, however, is that many people aren’t sure exactly where they hold debt and how much. Without clarity on the extent of your debt and a clear debt reduction plan, you may never make your dream round the world trip. And the thing is, you may not have to eliminate your debt before travel, you instead need a clear understanding of it and a plan. Student loan debt is a very different beast than a defaulted credit card payment. I cleared my credit card debt before leaving, but paid off my student loan for the first three years on the road—I had budgeted that monthly payment into my anticipated travel budget. The Tackle Your Debt page offers comprehensive advice to create an action plan for reducing debt so that you can effectively save for travel. Increase your income. If you have a job that comfortably floats your expenses, then consider adding on a part-time job or freelance work. Side hustles are gaining in popularity and this is a great topic to research. How to Work and Travel covers all the resources and advice I’ve discovered from well over a decade working online. Stay focused and motivated. Don’t give up, some people have a situation that allows them to save up a large sum in just a handful of months (often those who can move in with parents for a while), and others will need to take several years of slow and incremental savings, figure out what camp you are in and then stick to it. Allow yourself splurges in your life, but never from your travel savings account! Learn what you don’t already know. Information is available in dozens of ways from dozens of sources. You can master personal finance and saving money with time and effort. While there are many free resources, I created a comprehensive treatise on the topics of saving and budgeting for travel. 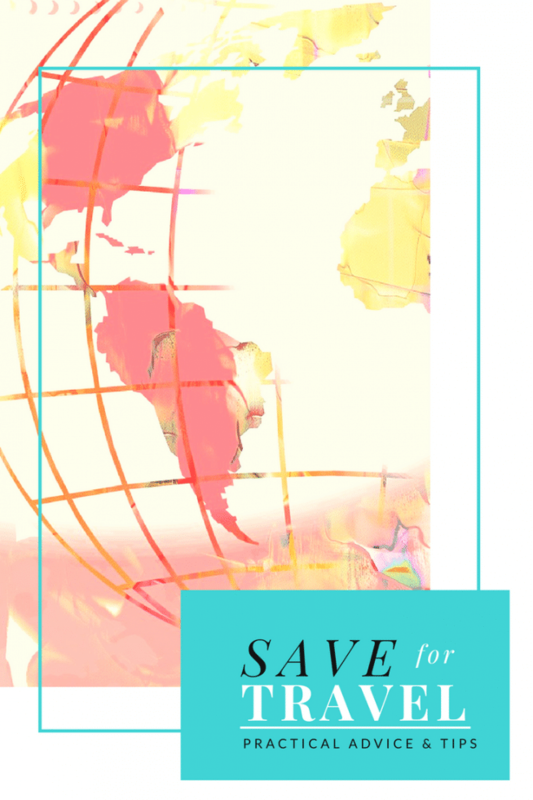 How to Save for World Travel is available on Amazon Kindle and there is nothing else like it on the internet. 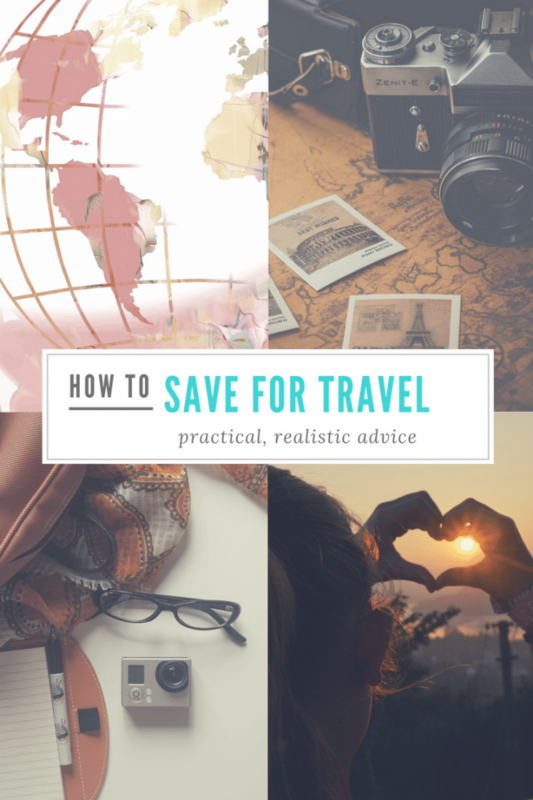 Instead of general finance and savings advice, this guide is laser-focused on offering solid, practical advice to specifically create enough savings to travel. Saving for travel is the single biggest process that will help you reach your goal. It takes several steps to create a strong financial base from which you tackle savings. And while some steps may seem superfluous, or even too granular, this process works. I’ve talked to dozens of travelers over the years and nearly every person followed the process I laid out. The timeline for each person varied, but all of those people who provided ideas and feedback spoke from a place of success—they successfully saved and completed an around the world trip. In the coming months and years, life may derail portions of your plan. Throughout it all, however, keep an eye toward your priority, travel. Of note is that your priorities may shift and change. Perhaps you begin budgeting and saving with the dream of travel, but you pivot that idea and instead decide to fund a new business. Or perhaps you decide to spend your travel fund as a downpayment on a house. All of these choices are viable priorities, and the savings process outlined above will work for any of these big life goals. Creating a habit of saving is about giving yourself the freedom to set your priorities and then accomplish them. I am a fan of travel, and you likely are, too. But that said, if it’s not your current priority, use the three-pronged process (eliminate debt, budget, and save) to fund your priorities. Make purposeful choices that align with whatever you have decided is most important in your life. Once you have the saving and budgeting portion of your own life down pat, then the next step is to develop an accurate estimate of how much your trip will cost. Other people’s round the world budgets are only helpful to an extent—your trip, your dreams, and your lifestyle all impact how much you will need for world travel. You may have dozens of Pinterest boards dedicated to the places you’d like to visit, but have you sat down to plot out how much it would take to plan a trip to those places? My guide, How Much Does it Cost to Travel the World, (Kindle and PDF) examines the cost of travel in various regions of the world. This guide deep dives into how you can plot a route that balances developed and developing economies, a tactic that extends your travels while also introducing you to fascinating new cultures and experiences. This guide also discusses how travel style impacts budget so that you can accurately plot out an average daily budget for the type of travel you enjoy. The book demystifies travel budgets for everyone from budget backpackers to couples to boomers. If you’re on the uber-budget end as a backpacker, then you’re looking at a different type of trip than those willing to splurge on extra flights and private rooms. 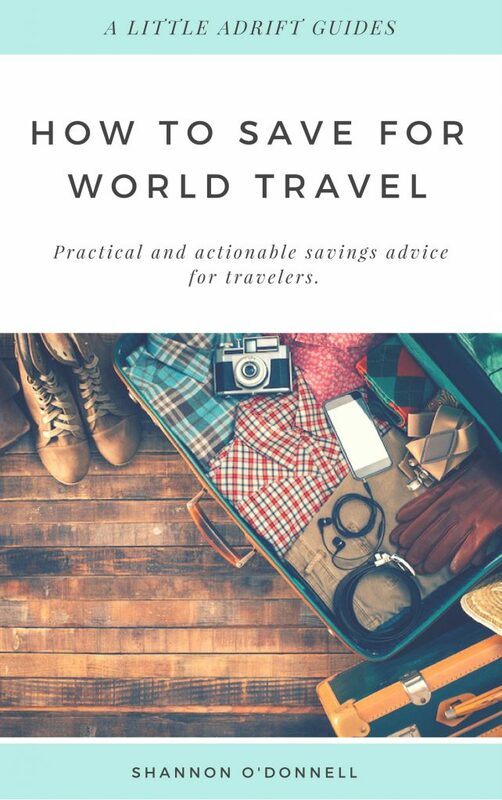 And while the budgeting tips in my follow-up book can help you plan a short vacation, the budgeting guide is intended to help you understand what it will take to actually start moving forward on your plans to travel around the world. It could be two months, or perhaps an epic two-year adventure. Either way, the costs of long-term travel are surprisingly lower than those associated with vacations and short-term trips. Even more, the book helps you create a trip around the world that you love and one that you can afford. Need More Advice About Saving for Long-Term Travel? 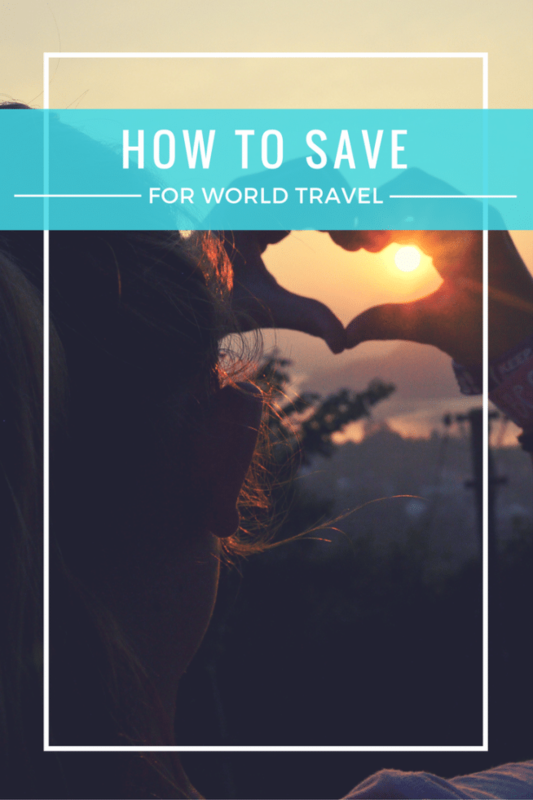 How to Save for World Travel is a comprehensive guide about every aspect of saving. It’s written from the perspective and experience of a long-term traveler (8+ years on the road). extensive information detailing how to create a personal budget. advice on how to think about saving money. practical advice on how to save money within your unique situation. ideas tailored to extreme budget and frugal life-styles so travelers on any income can begin the savings process. ideas to begin eliminating debt. information on how to generate additional income streams to fund your travel dreams. a custom worksheet to track your savings journey. The guide is available on Kindle or as a PDF bundle with the How Much Does it Cost to Travel the World guide.